Hi guys! Sorry about the late post! Things have been a little hectic at the moment! This week we've decided to move away from the Olympic nail art - though we've enjoyed every minute of supporting Team GB on our nails! As you can see, very simple and easy to do! Promise! 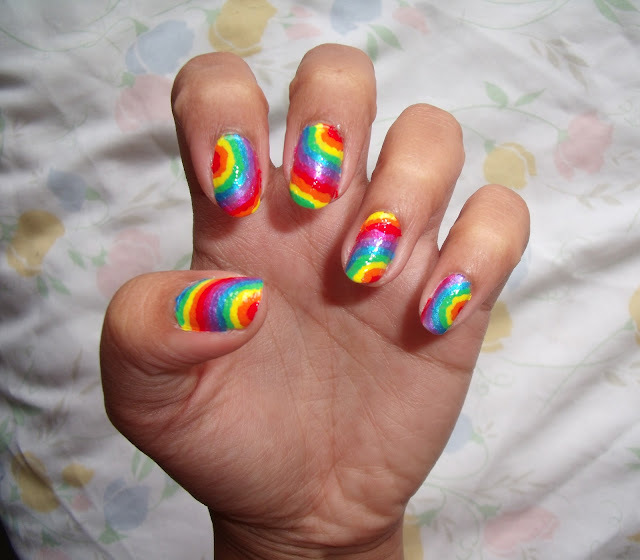 All you need is as many colours of the rainbow as you can get your hands on, and patience! Start at any edge of your nail with the red, painting a small semi-circle. Then work your way out with each colour following the rainbow. What do you think? What have you guys got on your nails at the moment?